Cravings: Chocolate. Chocolate. Did I mention that I'm eating every piece of chocolate in sight? Extras: I think it's safe to say that we're like 85% ready for this little guy. We are pretty much physically ready for him as far as his room being ready, all the clothes and accessories are washed, his moses basket is set up, the swing has been washed and is ready, the diaper bag is packed...that other 15% is me not being mentally prepared. The thought of having a newborn and a very busy 2 year old is daunting at times but I know it will end up being great. We already took the big leap of going from 0 kids to 1, so what's another one? I wish I could say that I'm feeling great but truth is, I feel like a fat pig who waddles around. I love being pregnant but I think the cuteness of having a belly has worn off and I'm over all of my maternity clothes. My mom said it best last night, I'm just a grumpy pregnant lady. I blame the dude and his testosterone. :) My weight is not pretty, I think this is the last check in where I will be sharing these numbers with y'all. 35 weeks and I'm up 26 whopping pounds of lard! I try to make myself feel better by reminding myself that Will is around 5.5 pounds right now and add another 5 pounds with all the other things in there and that's at least 10 pounds of baby. Whatever, it's all for a great cause and I know once I get to hold our boy I won't care how large I am. Next up on the things to do list is pack our hospital bag next week along with Kate's bag for the grandparents houses, get the cars detailed and install the infant car seat. Crazy! 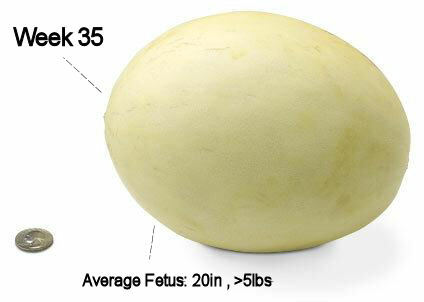 The little dude is now about 5 pounds, the size of a honeydew! You should feel better about yourself after reading this, don't you?